Lunar Rover Patrol is out of this world! 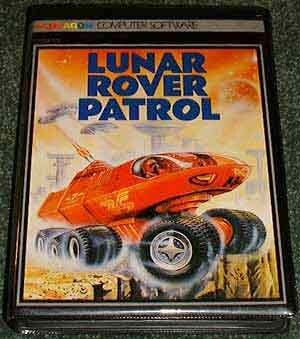 You're driving your lunar buggy across the spectacular, multi-coloured moonscape in this action packed fun filled game. Can you avoid the forces of alien starships while you bounce over craters and Moonrocks? 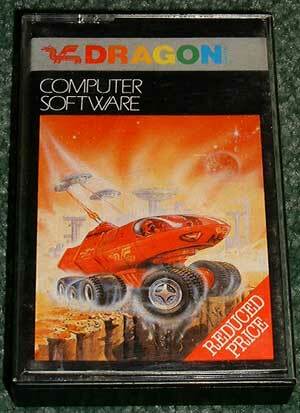 Essentially a 'Moon Patrol' clone and one of my favourite dragon games of all time. It was also the first game I ever hacked and worked out the POKE's for the number lives and start any where in the game. The archive's own big box version shown (left). Show (left) is the standard cassete case release from the archive. I can only guess that this was a late release, dumping the big box to save on the price. In game screen shot, shown at the very begining of the game.